TV with Thinus: Murdered Hope Zinde's dumped body found in the boot of her car 5 days after former SABC board member was killed; son arrested, drugs found. Murdered Hope Zinde's dumped body found in the boot of her car 5 days after former SABC board member was killed; son arrested, drugs found. The body of the murdered Hope Zinde (50) was found this (Saturday) afternoon by police, dumped in the boot of her Range Rover 5 days ago after the former SABC board member was killed apparently this past Monday, in the bathroom of her luxury Pecanwood Golf Estate house in Hartbeespoort Dam after which her body was dragged to her car. Mabalwa Hope Zenda Zinde was 50. Her only child, a son (28), has been arrested on suspicion of murder and charged and the suspect will appear on Monday in the Brits magistrate's court. A parcel weighing approximately 10kg and containing drugs, were found in the blood-smeared bathroom. Police was called to the house at Hartbeespoort Dam northwest of Pretoria today after Hope Zinde's son refused to open the door and reportedly only peeped through the curtains when a desperate family friend visited who had been trying to get a hold of Hope Zinde for 4 days since Wednesday. Police followed blood smears from the bathroom to the garage and found a heavy, bloodied 10kg parcel in the bathroom. "Following an incident where a 50-year old woman was found dead inside a boot of a car we are investigating a case of murder," says North West police spokesperson Sabata Mokgwabone. Hope Zinde was fired as SABC board member in March 2015, and claimed undue interference by the minister of communications, Faith Muthambi, in the workings of the SABC board and warned that Faith Muthabi is diluting the powers of the SABC board to run the SABC. Hope Zinde opposed the sale of the SABC's archives to MultiChoice to start the SABC Encore library channel on DStv and was also against the permanent appointment of the controversial Hlaudi Motsoeneng as chief operating officer (COO) of the SABC. Hope Zinde had an honours degree in psychology, a degree on social sciences and a marketing qualification from the University of Sienna in Italy from when she studied abroad. She was an executive manager at the Passenger Rail Agency of South Africa (Prasa) when she was murdered. Hope Zinde worked for the SABC for 15 years from 1991 to 2006 as a broadcast journalist who mostly covered politics. The biggest criticism of Hope Zinde's journalistic career came in 2005 when she was heavily criticised for her alleged biased reporting during the Zimbabwe general elections in 2005, telling viewers from Harare's Sheraton Hotel just a few hours after checking in that Zimbabwe is peaceful contrary to many Western media reports and that conditions in Zimbabwe is fine for free and fair elections. Since 2000 she was a producer, presenter and also a news anchor with Peter Ndoro for the 180 Degrees morning programme on the SABC's now discontinued SABC Africa TV channel that ran on MultiChoice's DStv platform. Hope Zinde who loved languages, marketing and reading, climbed the ranks as the SABC, starting as a newswriter and newsreader, moving to producer and executive producer on several SABC actuality shows like Perspective and also working as a presenter and anchor on television and radio like SAfm's PM Live show. Later on she ran Hope Zinde Communications that she started in 1998 and did PR and marketing for various companies, including clients like Coca-Cola South Africa. Hope Zinde's last tweet was this past Sunday, sharing an image of boxer Muhammad Ali shaking hands with Nelson Mandela, which she captioned as "The Greatest shaking hands with The Great One". Hope Zinde called her interview with Nelson Mandela one of her "most treasured" in her years as a journalist. Zinde's family in a statement says that it offers them great comfort to witness how loved she was and the positive contribution she made to the lives of so many. "While the investigation into Hope's untimely passing is in progress, we ask for your support in allowing the authorities to do their work, and not speculate on the circumstances surrounding her death". Peter Ndoro, now the co-anchor of SABC News's flagship weeknight news show, on Saturday told SABC News (DStv 404) that Hope Zinde "loved her work, She worked hard. And she was a person who was never afraid to speak her truth. And I think everybody appreciated her honesty". "It's really tragic to hear about her passing in this way. A sad story," said Peter Ndoro. "She wanted the story told and she got the story told." "As a colleague I will always just remember her as a strong woman who led the way for many of the young female presenter who we see here. She was one of the pioneers of programmes like Good Morning South Africa at a time when there were just not that many young black woman in the media doing important programming". Hope Zinde was a loyal ANC activist and supporter and remained so despite the way she was fired from the SABC board by Faith Muthambi. In a statement on Saturday evening the ANC political party said the party "extends its condolences to members of the South African and continental journalism fraternity on the loss of seasoned communicator, Hope Zinde who has passed away"
The ANC said "Hope Zinde was a well-respected journalist" and that she was "known for her passion and dedication to her craft, as well as her role in mentoring younger journalists". "The South African communications landscape has lost a committed professional who left an indelible mark on the industry as a whole, and the ANC extends its deepest condolences to the family and friends of the late Hope Zinde". In a statement the Democratic Alliance (DA) political party said it "sends its deepest condolences to the friends and family of media personality and former SABC board member, Hope Zinde, following her untimely death". "Her passion for public broadcasting was such that she was appointed to the SABC board where she fought to protect the SABC's independence". "The DA thanks Hope Zinde for her contributions to strengthening our democracy. In her, our country has lost a passionate, fearless, and dedicated broadcaster and advocate for a truly independent SABC". "Her legacy lives on, and it is for her, that we all as South Africans should continue to protect and build an SABC we can all be proud of". UPDATE Sunday 12 June 2016 13:00: The SABC in a statement on Sunday - in which it deliberately said nothing of how Hope Zinde was fired from the SABC board last year - said "the SABC has leartn with sadness and shock about the tragic passing of former SABC board member Hope Zinde". SABC board chairman Mbulaheni Maguvhe said Hope Zinde "worked tirelessly in the broadcasting arena in both television and radio". "She served the SABC board to the best of her ability during her tenure and the South African public has lost a giant in the field of journalism and broadcasting." "The SABC board, management, and staff sent their deepest condolences to Hope Zinde's family and friends". UPDATE Monday 13 June 2016 10:00: Minister of communications Faith Muthambi in a statement says she sends condolences to the family of the late Hope Zinde, who was found murdered at her home earlier this week. "We recognised Hope Zinde for the role that she has played in shaping the SABC, in particular, as well as radio and television broadcasting services in South Africa in general." "She enjoyed an illustrious career in broadcasting, and inspired a new generation of young people to follow in her footsteps. As the ministry of communications, we wish her loved ones, friends and colleagues strength during this difficult time. Our hearts are with them." 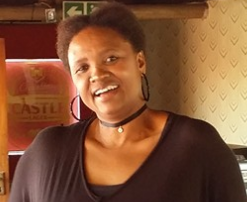 UPDATE Monday 13 June 2016 11:00: The South African National Editors' Forum (Sanef) says in a statement it has "expresses the collective shock of its members at the news of the gruesome death of journalist and media activist Hope Zinde." "Hope Zinde was amongst the generation of journalists who arrived at the SABC in Auckland Park at the dawn of democracy to help change the content of what until then had been a state broadcaster." "With her colleagues and the leadership of people such as the late Zwelakhe Sisulu and Joe Thloloe, they changed the news division into a credible source of information in the service of the South African public. She grew to become a household and respected anchor of prime programmes at SABC News". "She left the SABC but returned years later as a board member still determined to ensure the corporation fulfilled its mission to the public. It was this commitment that saw her clash with the reigning leadership of the SABC, who are steadily turning it into a centre of sunshine journalism where uncomfortable incidents of national importance are being steadily censored out of the news." "In her attempts to defend the integrity of the SABC, she turned to both the ANC top leadership and the minister in charge of the SABC but was rebuffed and eventually kicked out of the board." "South African journalism has lost a committed journalist, a campaigner for media freedom and a fearless advocate of sound corporate governance at the SABC. Sanef and its members convey our heartfelt and deep sorrow at the circumstances under which she died." UPDATE Monday 13 June 2016 11:15: The South African Communist Party (SACP) says in a statement it's saddened by the death of "media transformation stalwart" Hope Zinde. "The SACP expresses its message of sincere condolences to the family and relatives of a seasoned journalist, former SABC presenter, producer and board member Hope Zinde for the great loss suffered from her death." "The SACP will always cherish the memory of Hope Zinde for her total but principled opposition to the corporate capture of the SABC by monopoly capital, in particular, Naspers' Multichoice, and for uncompromising stance against corruption." "Hope Zinde stuck to ANC policies on the transformation of the communications industry in the face of massive deviation and buying of key individuals to go against the principle. It was in the course of this dedicated service to our people and country that she was victimised by being controversially and unlawfully removed from the SABC board."